Welcome to the official discussion thread for Mario Tennis Ultra Smash on the Wii U! To start, please add this game to your log, add it to your collection (if applicable), and (when you are ready) rate it using the link above! Holding out for a hero on Wii U this holiday season? With Link stuck in the Lost Woods and Team Star Fox delayed by asteroids who will pick up our dreams and carry us through the long winter nights? Step forward, Sir Mario of Tennis. Okay so the hype factor is low and there have been minimal details. Like bare minimal. Like the one thing we know is there are Mega Mushrooms; possibly the lamest, tacked-on gimmick Mario has ever pulled. I could hear your collective eyes roll when they revealed it. So the game is online. IT’S 2 PLAYER CO-OP online! That’s tasty. Also tasty is that local 2 player competitive will embrace the Wii U gamepad rather than split the screen. How to slice a Peach. Hey, we need a Direct, no doubt about it, and that Direct needs to show us lots of content but for the time being I think the videos look super smooth and we know that Camelot are capable so I’m staying posi. How about you? I could totally be down with this if we get a good community going. There wasn't much Mario Tennis 3DS love around here though. Love me some Mario Tennis. Not a fan of all the gimmicks, so I never got hooked on the GameCube version or Wii version. Mario Tennis 64 still feels the most pure tennis game to me. But you can turn off the gimmicks in the Gamecube versionnnn! Once you do, it's a fast, mean, beautiful game of tennis. However, you COULDN'T turn off the chance shot thing in the 3DS game, which sucked. (But it had single-cart multi, which was awesome.) My purchase of this new entry hinged on being able to turn off the gimmicks, particularly online. And it looks like you can! So I'll pick it up eventually. By the way, if you buy it in the first month, it comes with a VC code for Mario Tennis 64. So that's neat. Was there really chance involved in the 3DS game though? Having played a lot of it, I'm pretty sure that it was just a color coded way of teaching people how to deal with lobs, slices, dropshots, etc. Gamification/Mariofication of real tennis concepts, basically. There was a little "special move" aspect to it, but it really didn't make much of a difference. The real problem with online was that there was really limited options and the matches were super short. To clarify, I used the term Chance Shot because that's what they call it. Y ' know, I've tried to analyze it. It seems that the opponent only gets chance shots when you make a weak return, sort of like in Wii Sports Tennis. Still, I feel like they make the game less free form and flexible. They can be returned, but usually cause predetermined effects (unless returned perfectly). So you can kind of game the system. It just doesn't feel like tennis anymore. Which, honestly, is my increasing problem with the Mario Tennis series. I think the most important aspects of tennis are timing and court placement, both of which are incredibly poorly represented in Mario Tennis. It's less satisfying to stand in one place and "charge" your shots, and that's not how tennis works. Yea, the predetermined effects were what I was meant by the "special move" aspect. But those effects could be overcome pretty easily by a good player. I agree that it felt less pure even though the gimmick stuff didn't make that much of a difference. As for your other point, in my experience even in Mario Tennis 64, when high level players are playing it turns into a pretty predictable affair. That's why I always wanted a real Wii Mario Tennis because I felt like adding a new kind of dexterity requirement into the game through motion controls would make it more interesting. Wii Sports Resort ping pong is probably the closest we got. Yeah, I agree with that. I also think that Wii Sports Baseball did a good job of distilling the batting experience down to pitch recognition and timing. It felt way better than moving a circle around during the pitch. By predetermined effects, I didn't mean the shot. I meant the opponent's reactions (I.e. The opponent being forced backwards when returning a chance topspin). I think other games, like Top Spin, have represented the pure essence of tennis more accurately. But it has some other problems. 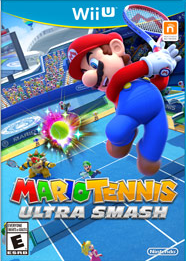 Still, I'd love to see that team's take on Mario Tennis. Typing on a tablet blows. Yea I know that's what you meant. I was saying that being pushed back wasn't a big deal if you knew it was coming and how to recover. Hard to be excited for this, I had my fill with Mario Tennis Open. The amiibo implementation is kinda cool though. I like the gimmicks because they're what separates this series from any regular tennis game, so they're fun. Bring on more gimmicks, I say! That said, there doesn't appear to be enough new about this game for it to be anything more than a bargain bin purchase for me, and the character roster looks to be smaller than past games. I can't tell, but this game probably doesn't use motion control either. Color me surprised this has online. This feels a lot less phoned in now based on this news alone. I was kind of interested in this before but no online for this game really hurt. I thought this was gonna be another Mario Party 10 (ie lazy cash grab) but it looks like they at least included an online mode! It's now got a spot on my radar again! Playing online with my bro(s?) could be fun! Apparently there's no motion control, not even as an option. I love Mario, I love Tennis, but somehow Mario Tennis has never done it for me. I've played bits of the N64 and Gamecube entries, and they were okay but didn't hold my attention long. Club Nintendo put the N64 game up a few years ago, I played for like five minutes before being bored to tears. And nothing about this new one looks especially enticing, either. Wish I could pinpoint why this series just doesn't grab me. I enjoyed Grand Slam Tennis well enough on Wii for a short while, so maybe Mario Tennis just needs motion controls. That said, Mario Tennis did give us Waluigi, so it's got a great legacy attached to it at least. Whoa, Waluigi's first appearance was Mario Tennis? On 64?? Yeah Mario Tennis isn't the most inspired Mario Spin off but I imagine it's fun. Mario Golf though, THAT one I remember being really awesome! I want a new entry in that series! Don't get me wrong, I like the gimmicks too. Especially for local multi. I just felt like, at the grand unveiling, they showed... um... one gimmick. Like, "here's the Mega Mushroom, you're welcome, we'll be taking that pre-order now." For the record I love that we can turn off the gimmicks too. I'll be all about that pure tennis online. Question: What meat can they possibly add to a tennis sim to give it longevity? Online tournies. A checklist of challenges. Er, Splatfests? I know Camelot don't exactly go above and beyond with their games but I wonder if we can cook up some ideas for em. Just reading on the new teaser site about training up your amibo and joining forces to challenge players online. I would so be into that. How perfect for loners and only children. I could be tempted to buy an amibo for this. It will be interesting to see, when it all shakes down, which game handled "AI training" the best. It's such a neat concept. Is it happening elsewhere? I'm outta the loop lately. Does it work? I love the idea of yelling obscenities at my Toad amibo when he fluffs a return. Maybe shoving him off the coffee table then telling him, "Get up, you're a disgrace." Maybe I shouldn't have an amibo. @Super_Conzo This ain't a tennis sim, it's Mario Tennis! Bring on teh crazies. You at least shouldn't have any valuable amiibos if you're going to beat them up like that. Wouldn't be cheap to replace 'em! But at least you're having fun with your figures instead of hoarding them inside their packaging. Don't worry, I couldn't treat little Toad like that. If he did fall off the coffee table I'd crouch down and be all Alfred, "Why do we fall, Master Toad?" I take it all back. The mushroom looks neato, you have to gamble with your position to grab it.